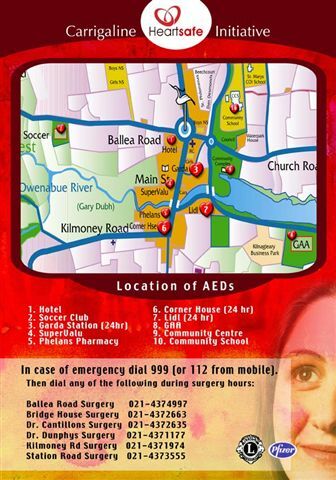 In April 2007, Carrigaline achieved what is known as ‘Heartsafe’ status from the Irish Heart Foundation. This means that people in Carrigaline are never more than eight minutes away from an Automated External Defibrillator (AED) and a person trained in CPR. The Heartsafe programme was implemented through the partnership of the Carrigaline Lions Club, Pfizer Healthcare and the Irish Heart Foundation. Nearly four hundred people were accredited and recognised for showing commitment that will help make their community one of the safest in Ireland in terms of cardiac arrest. Minister for Enterprise, Trade and Employment, Mr. Micheal Martín TD attended the event in the Carrigaline Court hotel and he praised the citizens of Carrigaline for the care they have shown each other. Carrigaline is a community of more than 15,000 people and in order to make a town of this size Heartsafe, 300 local people undertook CPR training with a further 92 taking training in the use of AEDs. This is backed up by the strategic placement of ten AEDs around the community and this does not include defibrillators already present in some GP surgeries.